The BankAmericard® Credit Card is a no-frills credit card that boasts a long introductory period with a 0% balance transfer and purchase APR. It competes with a number of popular no-frills cards, such as Chase Slate, Citi Simplicity, and U.S. Bank Visa Platinum. It’s also comparable to some entry-level cash back rewards credit cards with introductory APR promotions, including Chase Freedom, Capital One Quicksilver, and members of the Discover it family. It’s worth noting that the BankAmericard® Credit Card doesn’t have a rewards program, sign-up bonus, or any of the luxury benefits common to some other credit cards. On the other hand, it’s easier to qualify for than some competing cards. Although you probably won’t qualify for this card if you have a thin to nonexistent credit history or serious credit blemishes – such as personal bankruptcy – you also don’t need excellent credit to gain approval. This card comes with a long, generous 0% balance transfer and purchase APR promotion: 18 billing cycles. Qualifying balance transfers must be made within 60 days of account opening. The BankAmericard® Credit Card has no annual fee. The international transaction fee is 3% of the total transaction amount, while balance transfers cost the greater of $10 or 3% of the transferred amount. If you have a Bank of America® deposit account, you can link it to your BankAmericard® card to prevent overdrafts. In the event of an overdraft, your card is charged in $100 increments – for instance, if a bank account charge results in a $150 overdraft, your card is charged $200. Overdraft charges cost $12 apiece and accrue interest at the maximum cash advance rate. This card requires good to excellent credit. A few minor blemishes aren’t likely to disqualify you, but any major issues with your credit report probably will. Excellent 0% APR Introductory Promotion. This card has one of the longest balance transfer promotions around: 0% APR for 18 billing cycles on transfers made within 60 days of account opening. That’s longer than the U.S. Bank Visa Platinum Card (12 billing cycles). The purchase APR is 0% for an equal length of time. No Annual Fee. The BankAmericard® Credit Card doesn’t have an annual fee, further reducing the cost of a card that’s already fairly cheap to carry a balance on. Overdraft Protection for Bank of America Deposit Accountholders. Current Bank of America® deposit accountholders can take advantage of BankAmericard® Credit Card’s overdraft protection feature, which reduces the likelihood that you’re unable to make a bank account transaction due to insufficient funds. Other credit cards associated with banks, such as Discover it and Discover Bank, do not have overdraft protection arrangements. Doesn’t Require Excellent Credit. BankAmericard® isn’t a secured credit card, nor is it billed as a card that’s ideal for building credit. 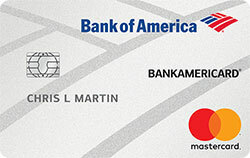 However, Bank of America is clear that this card is much easier to qualify for than more generous, rewards-rich cards. As long as you don’t have any major blemishes on your personal credit, you’re likely to be approved for this card. If you use it responsibly over time, your credit should improve – and you may find yourself eligible for more exciting, generous cards. Low Balance Transfer Fee. This card’s 3% (or $10, if greater) balance transfer fee is unusually low. Many competing cards’ fees, including those with long introductory balance transfer APR promotions, top 4% or even 5%. Coupled with its own 18-billing-cycles 0% balance transfer APR promotion, BankAmericard®’s low balance transfer fee is a big incentive for applicants who wish to transfer high-interest card balances at relatively low cost. No Rewards. The BankAmericard® Credit Card doesn’t have any cash back or point-based rewards. If you prefer to get paid back in some fashion for your purchases, this isn’t the card for you – especially if you don’t plan to carry a balance from billing cycle to billing cycle. No Sign-up Bonus. This card doesn’t have a sign-up bonus. That’s a drawback relative to many competing cards, including Chase Freedom and Capital One Quicksilver. No one can accuse the BankAmericard® Credit Card of being exciting. With no rewards program, sign-up bonus, or luxury benefits, it’s fair to say that this card is downright boring. However, there’s something to be said for a downright boring card – particularly when it has one of the best introductory APR promotions and lowest ongoing interest rates around. If you’re looking for a no-frills credit card that offers great deals on balance transfers and doesn’t cost a pretty penny to maintain, you can definitely do worse than this piece of plastic. The BankAmericard® Credit Card is a plain vanilla credit card that’s ideal for people with less than perfect credit who wish to finance major purchases or transfer high-interest balances from existing cards at low cost. It’s not ideal for people seeking rewards programs or luxury benefits in exchange for making purchases. This card’s great 0% APR introductory promotion and overdraft protection for Bank of America customers – not to mention the lack of an annual fee – are all great perks. However, the lack of rewards and sign-up bonus on late payments are all drawbacks. Overall, this is a great no-frills cards for consumers seeking low-cost financing.